Rubber stamps are amazing. They have quite the history within mail art! They are fun to use and even more fun to make. 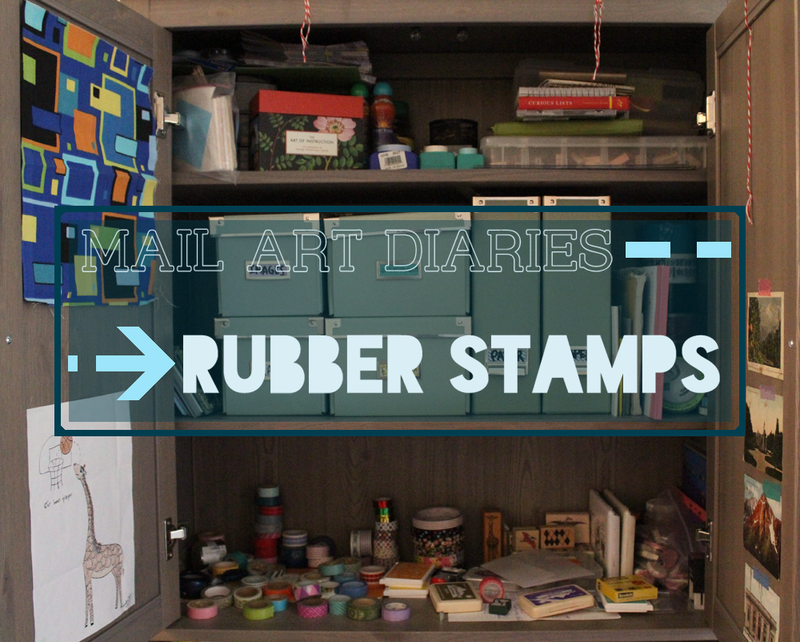 Some mail artists create their mail art exclusively with rubber stamps. I don’t know how they do it but they do, and they make it look amazing. I’ve never had a huge collection of rubber stamps due to cost. If you have the same problem, you should definitely consider making your own! 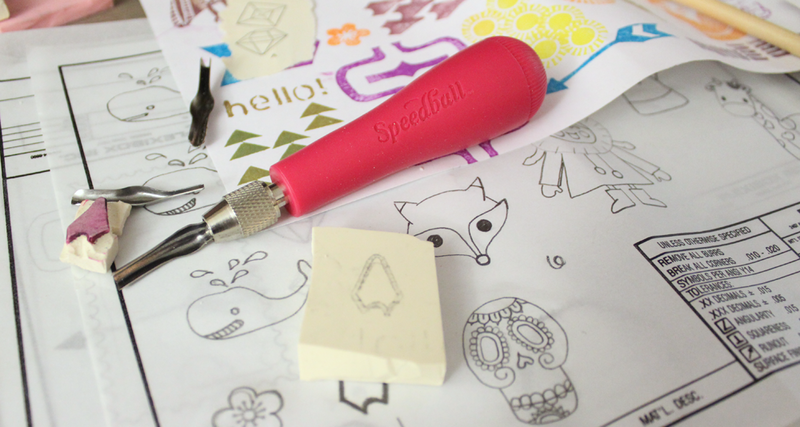 To start carving stamps, you just need a few supplies. I had carved this shape before and used it so much that it started to fall apart! I decided I wanted to make another. My pen pal actually drew the shape (and all the other drawings you can see on that paper). We had a huge stamp-carving sesh when she was in town awhile back. I absolutely love carving stamps but I’m not the best at drawing so it was super awesome she could draw! We drew everything on tracing paper and then rubbed it onto the carving block to start carving. You can totally draw straight on the rubber and avoid that step. I find it a bit difficult to draw directly on the block, especially with a pencil. The white carving blocks are very soft and a pencil ends up digging into it. I imagine you could avoid that with a nice ballpoint or gel pen. If you draw directly on the block, be sure to flip any lettering! Carve out your image! You should have an idea of where you want your negative and positive space. My entire shape is positive space so I just had to carve all around the shape. If you have a more detailed stamp, I would suggest shading the areas that you don’t want to carve out, or something similar. There have been times I get my image on to the carving block and then end up cutting out a space that I shouldn’t have. Oops! It’s nice to have a little reminder once you get into the flow of carving. After a bit of carving, I like to put some ink on the stamp and test it out. This is very helpful if you have a more detailed stamp, as you can plainly see what areas might need a bit more carving. Keep doing this until your stamp is how you want! See? It’s pretty simple, especially if you just want to make a bunch of shapes. Which I totally recommend because it looks awesome on a collage, especially when you make a nice pattern out of it! I also highly recommend using tracing paper as it is an easy way to store your designs. 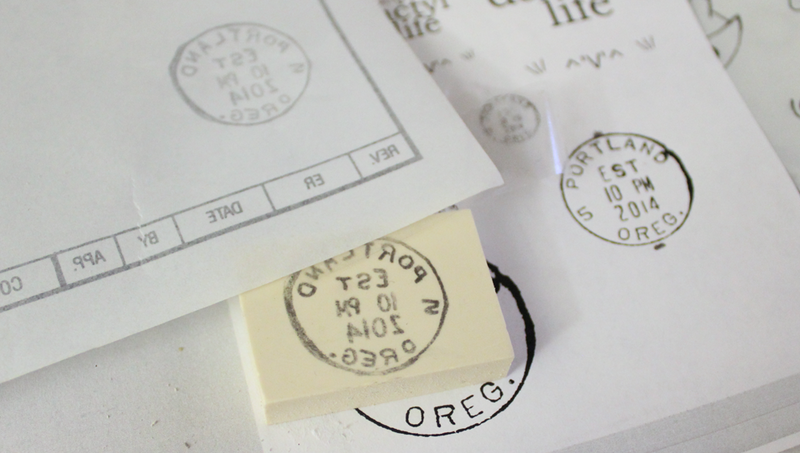 It really comes in handy if you ever need to make a duplicate stamp! Here is an example of lettering. I traced over a printed image, put the tracing paper pencil-mark side down on the carving block, and rubbed the paper until it transferred on to the rubber. This is the only way I can carve out letters. Free-handing that is way too complicated for my brain!